I am slightly obsessed with The Walking Dead on AMC. Very rarely do I get into a TV show (with the exception of The Real Housewives of (wherever) and maaaaybe The Bachelor/The Bachelorette (depending on the season)). But my favorite is definitely The Walking Dead. 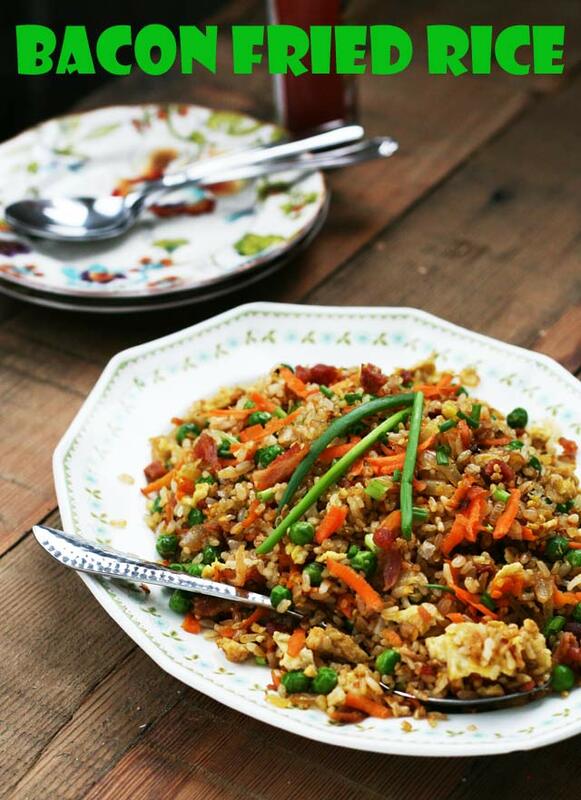 This past week I made this de-licious bacon fried rice from Shutterbean. We both loved it. Because there are both bacon and eggs in it, it had an interesting breakfast-y taste to it. I topped mine generously with my new favorite sauce (Annie Chun’s Gochujan). Rice-based recipes are generally pretty cheap. To save money, I bought a container of bacon from the grocery store salad bar. Most of the other ingredients were ones that I already had on hand. This was an exceptional meal that didn’t cost much money at all. Try this similar recipe: Korean barbecue fried recipe. First time visiting Cheap Recipe Blog? I’m thrilled that you are here! Stay up-to-date on the latest cheap recipe posts by liking my Facebook page or following my Pinterest boards! I used bacon from the grocery store salad bar instead of cooking my own. One small container full (about 1/2 cup) cost just 23 cents. If you can't find ready-cooked bacon like this at your grocery store, just prepare your own. Place a large frying pan or wok over medium-high heat. Pour in a couple tablespoons of cooking oil. Cook onions for a couple of minutes, until they begin to soften. Add garlic, ginger, green onions, peas, and carrots. Cook for a few more minutes until everything is heated. Remove from pan and set aside in a separate bowl. Return frying pan to stovetop. Add a bit more oil, if needed. Cook rice until it becomes a bit crunchy, about 5 minutes. Move rice to the side and add beaten eggs. Once eggs are scrambled, add onion/pea mixture back to the pan. Mix everything together and cook for a couple more minutes. Add soy sauce and stir. Remove from heat and serve. Garnish with chopped green onion and sauce, if desired. I love making fried rice. We like anything with bacon so I’m sure this would be a hit in our house. Thanks for the recipe! I’m a Housewives fan myself that can’t wait for Breaking Bad to start. It is just so much fun to tuck in with a plate of good food and your favorite show. I’m making this! Thank you so much for your vote Haley. I can’t thank you enough for taking the time to show my recipe some love. I agree, Karen! And BTW, I’m going to plan on making your bacon corncakes next weekend for my family. They seriously look & sound amazing! I got the book “Breakfast for Dinner” in January that had this recipe in it- this was one of the first things I made from it! So good! This was so simple & easy!! I made it for my dad for breakfast and he thoroughly enjoyed it. I kept the bacon grease in the pan and used it to fry up the veggies. It was a hit! So glad you and your dad liked it! I never thought of making it for breakfast, by the way. Sounds like a yummy way to start the day! 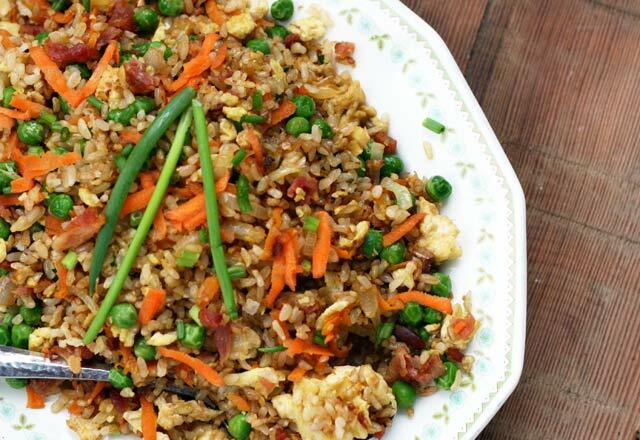 The name of recipe Bacon Fried Rice sounds good as its taste!! I loved fried rice. You done a great job, by sharing this recipe with us. Its so yummy & thank you for sharing it.